Superior Spider-Man Team-Up currently exists this weird in-between zone where the end of the main “Superior” book has forced this series to run out the clock a bit until its cancellation in April. As a result, I’ve been a little anxious about what we were going to be getting in terms of these next two issues, which have been promoted as “untold tales” of sorts. Fortunately, Kevin Shinick continues to bring the goods with this title’s script, while one of my favorite Spider-Man artists (and a good friend of the Superior Spider-Talk podcast) Ron Frenz provides some wonderfully vintage pencils, leading to a surprisingly well put-together issue of Superior Spider-Man Team-Up #11. 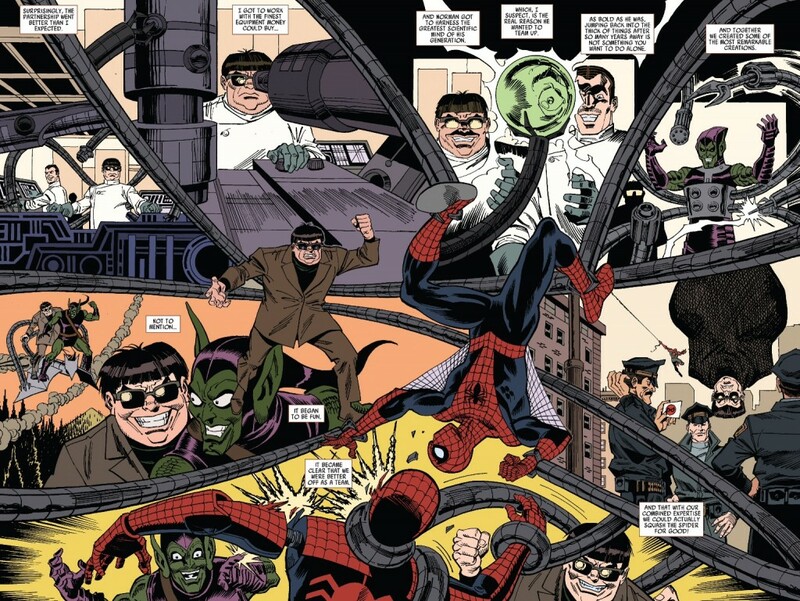 The story spotlights an untold team-up between Doctor Octopus and Norman Osborn. 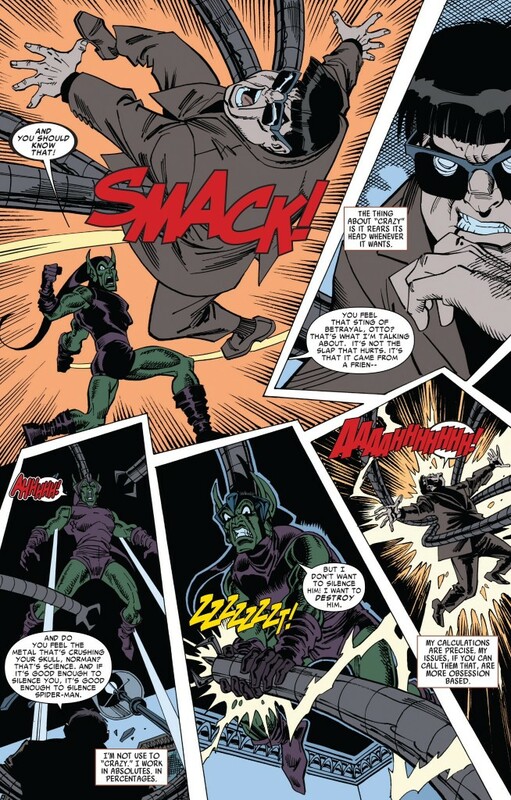 Taking place sometime after Osborn’s “death” in Amazing Spider-Man #122, but before he was revealed as the mastermind of the “Clone Saga” (and thus kicking off the modern age version of the Green Goblin), Shinick and Frenz do an admirable job crafting a story that demonstrates how two villains can be so drastically different from each other personality-wise, and yet still be considered arch-foes to Spider-Man. 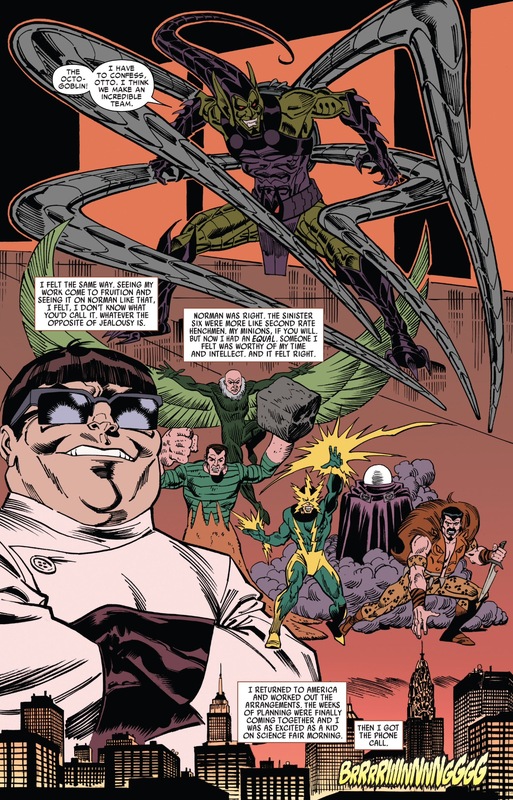 Oftentimes, even the best villains are treated as homogenous entities who can be mixed and matched depending on the superteam du jour, whether it’s the Masters of Evil, the Frightful Four or even the Sinister Six. But in the case of Doc Ock and Norman, this is a pairing that is doomed to fail not strictly because of token “ego” problems among the villains, but because these two guys just view the world of villainy from starkly different perspectives. Shinick’s script encapsulates how Otto and Norman are both crazy people but their craziness comes in different forms. Otto is methodical and deliberate. He is a master planner who uses the game of chess as an analogy. The Goblin is chaotic and unpredictable. He can appear to be in complete control for one second, and then snap and do something barbaric the very next instant. In one scene, Otto and Norman try to connect with each other with disastrous results. Both talk about the loves they’ve lost, but there’s really no way to relate the two experiences in a way that will help these two men understand each other. Norman’s wife Emily died soon after Harry’s was born, forcing Norman into a life of work and soon, insanity, whereas Otto was engaged to a woman Mary Alice, but broke things off because his mother wouldn’t allow the relationship. If those two scenarios don’t speak to the major differences between these characters then I don’t know what does. Norman’s misfortune is uncontrollable and unavoidable, whereas Otto’s was caused by his inability to assert himself and follow his heart. 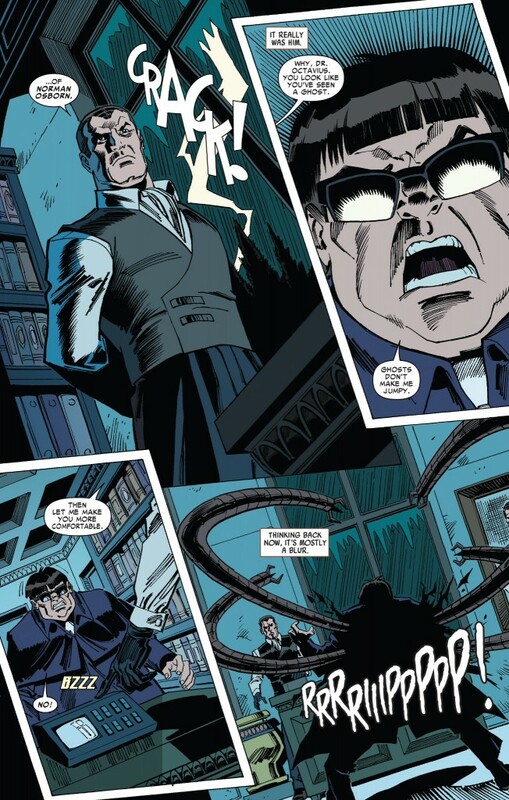 The end result of this conversation is Norman losing control when Otto talks of being the “greatest scientist who ever lived,” rather than being focusing on crushing Spider-Man, and the two beat each other around the room before Osborn takes a step back so he can continue his “recovery.” But the interaction would be referenced much later when Norman tells Otto that he “never experienced the pain I’m talking about,” and then goes on to do a very Green Goblin-ish thing to the unsuspecting Mary Alice. Shinick’s comedic background is such an asset for this book and for the Spider-Man universe, that I really hope Marvel finds a role for him once the Superior status quo is done for good. 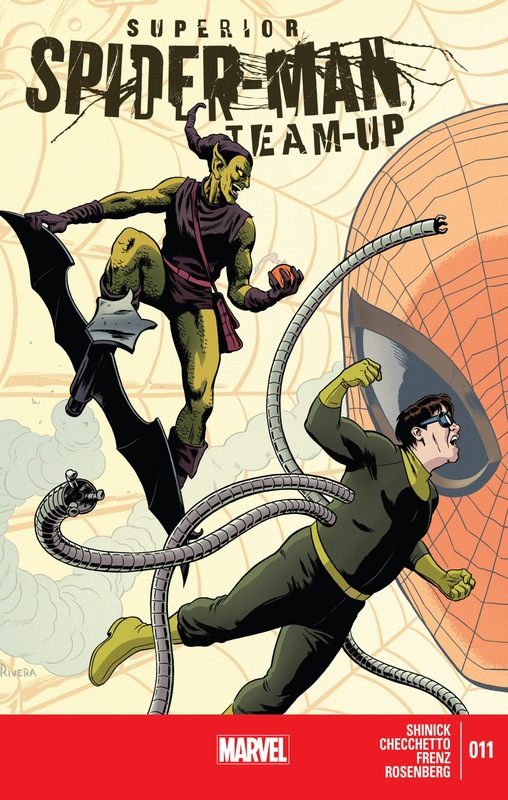 In one scene, Shinick and Frenz unveil Otto’s master plan for a new and improved Green Goblin – an “Octo-Goblin” that gives Norman some extra mechanical appendages. It’s such a true-to-form Otto Octavius solution (not to mention a very 90s Marvel concept); you can’t help but shake your head at laugh. And true to Norman, he calls a week before they are set to enact their master plan to tell Otto he wants to do something different. When Otto resists, Norman tells him to get over his inventions and to be more spontaneous (the line about Otto answering the phone with his arms is precious). I continue to find these little character-centric pieces that Marvel has been doing in some of the “B” books to be quite entertaining. We can sit here and argue what’s truly “cannon” and what’s not until we pass out, but as long as I derive some joy and pleasure from my reading experience like I did here with Superior Team-Up #11, I will continue to support this storytelling format. In general, I liked the overall idea of the story but the words coming from Goblin just didn’t ring true with the Norman that I know. Reminded me of a hip, chatty Bendis writing style. I didn’t see much Frenz style in the art. It looked like Ron’s pencils were very loose and Sal did most of the work with the inking. I’d give it a 5.5 or a 6 out of ten. Couldn’t disagree more. Norman’s dialogue was very reminiscent of 90s Norman for me, which makes sense since that’s probably the time period this storyline takes place. You can argue if that’s a golden era of Osborn or not, but I just have an innate inclination to like Shinick’s characterization and scripting style. I’m really not arguing with you on this one because you’re usually correct, but I have no memory of Norman speaking like this. Just so that I know what you’re talking about, if it’s no trouble, could you give me a couple story arcs where he’s like this so I can go back and read them? The thing I don’t love about Shinick’s writing style is that, IMO, he glosses over things we know about characters in order to write a pleasing and exciting story. Maybe I’m just a stickler on these things, but I hated his Daredevil issues in Team-Up. I think I need to get over that because Marvel seems to be attempting to appeal to newer readers and the distant past details of a character aren’t very important to them. Another possible silly reason that I think I didn’t like this issue was that when I read that Ron Frenz was drawing it, subconsciously, I was hoping it would have more of an eighties-era DeFalco/ Stern/Frenz feel about it and it came out very nineties, which I despise. The Frenz style here looks tweaked. It is as if he picked up several new artistic inspirations. For example, that Spider-Man dummy looks very reminiscent of Sal Buscema’s Spidey. The art looks a lot more like Buscema than Frenz to me. Not that I’m really complaining about seeing the return of Buscema’s distinctive line work. I actually loved everything about this book, from the art to the dialogue to the interesting narrative. If this story would have ran earlier in the Superior era I probably would have felt more sympathetic to the Spider-Ock character from the get go.